Father of soldier held by Hamas reveals Defense Minister compared situation to Eli Cohen, whose body has been held by Syria since 1965. A memorial ceremony was held Friday morning for IDF officer Lieutenant Hadar Goldin in the Kfar Saba military cemetery. Lt. Goldin was killed during a Hamas violation of a humanitarian cease-fire during Operation Protective Edge in 2014. His body has been illegally held by the Hamas terrorist organization in Gaza for the last 3 years. Hundreds of people participated in the ceremony, including Public Security Minister Gilad Erdan, former Defense Minister Moshe Ya'alon, former MK Shachiv Shanaan, who lost his son in a terror attack on the Temple Mount two weeks ago, and Coordinator of Activities in the Territories Major General Yoav Poli Mordechai. 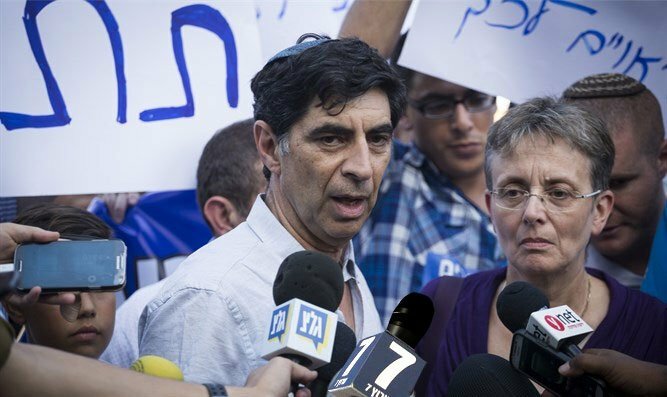 Hadar's father, Prof. Simcha Goldin, sharply criticized Defense Minister Avigdor Liberman's handling of the effort to bring his son's body home for burial. "Liberman is not working to create a solution. He is the man who promised before he assumed the position of defense minister that he would return Hadar and Oron and subdue Hamas within 48 hours." "Two days after the last Memorial Day for fallen soldiers Liberman told us, the Goldin family, the Shaul family, all of the parents of the soldiers who are risking their lives, that Hadar and Oron wait - like [former Israeli spy] Eli Cohen waits for his return to Israel. "It happened two days after Memorial Day, the day after Independence Day when he was interviewed on the military radio station." Eli Cohen was an Israeli spy who befriended senior Syrian defense officials in the 1960s. Cohen is credited with providing Israel with intelligence crucial to the IDF's victory on the Golan Heights during the Six Day War. Cohen was caught in 1965 and executed. His body has never been returned to Israel. Goldin accused the defense minister of intending to abandon his son for decades to come. "Liberman is sending us into a 50-year nightmare! The defense minister must know that when he acts, both against pressure on Hamas and against an agreement, he actually acts against the values ​​that are the essence of the people's army." The bereaved father also said that "the Givati ​​Brigade was unable to bring Lieutenant Hadar Goldin back from the battlefield. The brigade fought for a day and a half to fulfill the obligation between the commanders and the soldiers' families. A day and a half - and then they stopped. Representatives of the Israeli government went to Cairo at the end of the war, reached an agreement with Hamas and left Hadar and Oron in the hands of the enemy. This has to be corrected, and together we will correct it." Goldin emphasized that the Israeli leadership is abandoning Hadar and Oron. "The leadership of Israel, headed by the prime minister and the defense minister, the two who send and remove soldiers from the battlefield, abandon Hadar and Oron again and again." "We now have an opportunity to educate the enemy. We have an opportunity which will not return to end a military campaign with the most favorable agreement for the State of Israel since the Yom Kippur War. We have an opportunity to make a correction, to turn the equation and bring the IDF soldiers back home," added Hadar's father.